Tune in now & help Radiothon reach a milestone! 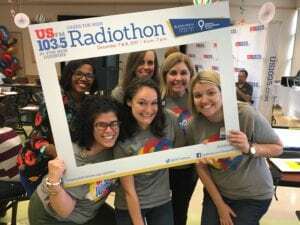 The US 103.5 FM Cares for Kids Radiothon is broadcasting live from Johns Hopkins All Children’s Hospital and we need your help. Today through Friday, we’re sharing exciting and inspirational stories from patients and families whose lives have been helped by the expert care they received at Johns Hopkins All Children’s. Your donation in any amount today can help us reach $2 million in funds raised since we began Radiothon in 2008. Next post: Thank you for making Radiothon a success!